How much and when to use Garden Pearls? From region to region, every soil is different, therefore, every garden has different needs. However, there are a few simple rules that can help you learn how much Garden Pearls to use. You live in a high rain fall region. Apply 25 to 50 lbs. of Garden Pearls Calcium Carbonate every year to all plants, including the lawn, which require a soil pH of 6.5 or higher. Go to our pH chart for examples. Go to our application chart or follow the lab recommendations. Go to our application chart. You use fertilizer and weed killer for a nice lawn, but it is hard to keep the grass perfect. Test your soil for pH and go to our application chart. Apply Garden Pearls Calcium Carbonate and continue to enjoy your beautiful lawn. You have your soil tested and received a gypsum recommendation. Follow the lab recommendation for gypsum. You live in a low rain fall region. Apply 12 to 25 lbs. of Garden Pearls Gypsum every year to plants that have a need for calcium and sulfur. Apply 12 to 25 lbs. of Garden Pearls Gypsum, then use water to wash out salts every year. Add 2 lbs. of Garden Pearls for each wheelbarrow of compost. Build higher pH soils, add Garden Pearls Calcium Carbonate to potting soil purchase from your garden center. To prevent nutrient leaching from compost or aged manures, add 2 lbs. per wheelbarrow of either Garden Pearls Calcium or Garden Pearls Gypsum. 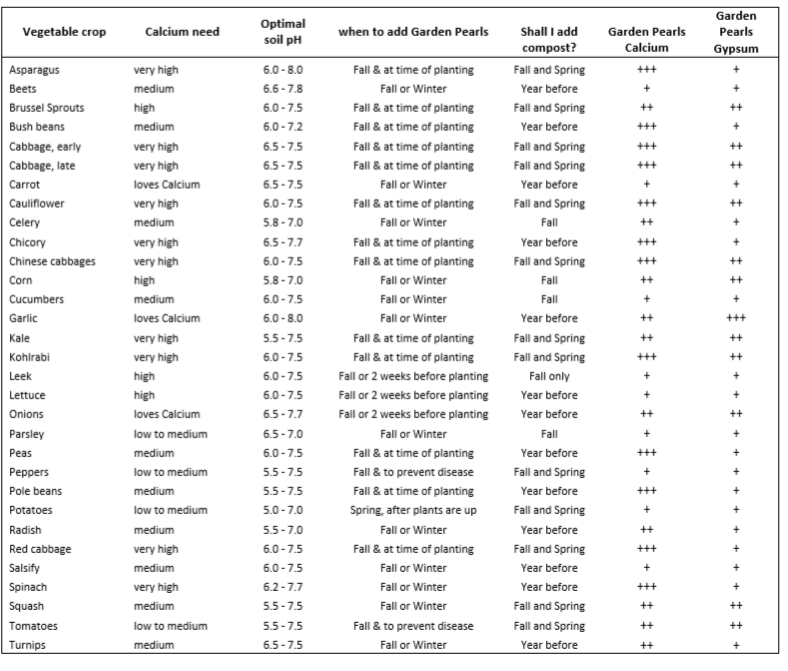 Which vegetables need Garden Pearls Calcium and Gypsum the most? To make it very simple, just look at the +++ sign in my table. These plants must have the recommended rate of Garden Pearls at least every second year to grow well. The ” +++” signs indicate, that a plant: +++ must have, ++ should have, or + could use Garden Pearls. If your soil pH is correct, it’s o.k. not to add Garden Pearls Calcium this year. Use the pearls on your lawn instead, it can always use some loving care.